I will be honest and will say that I probably would have overlooked Shrapnel’s The Virus Conspires if not a pointed request by the label to give it a listen. 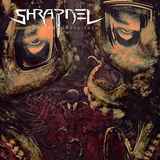 With my longstanding respect towards Candlelight Records USA staff I needed to give Shrapnel a shot, and, in the end, I definitely do not regret it. Being a traditional thrash album I thought this would be a quick uncomplicated run-through, as well as an easy review to write. Yet, while The Virus Conspires does adhere to a system of checks I measure up thrash albums against, it had a certain edge and degree of catchiness to it, that the original spin became a few more, mostly concentrated on the cuts which became favorites over time. Speaking of my “thrash checks”, this relatively young UK collective (The Virus Conspires is their first full-length) passed many of them with flying colors. Headbanging – no question. Fast feet-tapping rhythms – you bet. Shredding guitars with melodic moments hanging onto mainframe like pieces of sinew connecting together the old dug-up skeleton – the album is full of them. Breakneck speed – it begins from the start with Kingdom Come and is present throughout until the blistering All That We Know closes up with the drilling solo. Yet, while no doubt influenced by the thrash gods Testament, Kreator and Overkill, Shrapnel have a modern sounding edge in their production, and go out of their way to make sure their thrash is constantly ferocious, testosterone pumped and ripping at the seams, while slipping in a breackdown or two (the slowdown in Braindead sounds a lot like Judas Priest Grinder and The Watchers is actually replete with the starts and stops). Jae Hadley, appropriately, makes his voice a slithering snake, and a pair of guitarists Nathan Sadd and Chris Martin do not shy away from soloing (Titan, The Wake), at times going for a classic dual guitar melodic sound (22). The Virus Conspires walks an appropriately fine line between ruggedness and melodicism. Pseudocommando begins a little slower, somber, with a harmonic touch, but moves on to pummeling. The title track offers some power chording, less saturated with shred, and takes a melodic inflection before hard driving chorus. Bass slapping leads the way in 22, the song reaching the level of hookiness found in Swedish melodic death school, emphasis on “death” not diminishing. Slight tempo variations between the songs or within a single cut (Red Terror) makes the album flow by easier, without stagnating on the obvious riffs. While not your most avid thrash fan here, I need to thank the label for making me go back to this album. Those who worship the aforementioned thrash titans will do well to add Shrapnel in their up-and-coming list.